Inventory We are a resale marketplace, not a box office or venue. Ticket prices may exceed face value. This site is not owned by Prudential Center . 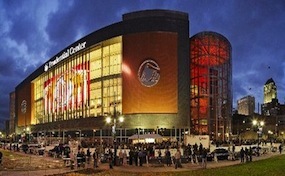 Prudential Center is a multi-purpose indoor arena in the Downtown district of Newark, New Jersey. The arena was designed by Populous (formerly HOK Sport), with the exterior designed by Morris Adjmi Architects. Opened in 2007, it is the home of the National Hockey League's New Jersey Devils, the NCAA's Seton Hall Pirates men's basketball team, and is the temporary home of the National Basketball Association's New Jersey Nets until the new Barclays Center opens in Brooklyn. The arena seats 17,625 patrons for hockey and 18,500 for basketball. Fans and sports writers have affectionately nicknamed the Prudential Center "The Rock" in reference to the Rock of Gibraltar, the corporate logo of Prudential Financial, a Fortune Global 500 and Fortune 500 financial institution that owns the naming rights to the arena and is headquartered within walking distance of the arena. CenterNewark.com is a privately held company that specializes in the sale of tickets in the secondary market. We are not affiliated with any official supplier or box office. To purchase tickets to any Prudential Center in Newark events simply call our operators at anytime or click on the event you wish to attend.